Maruti Suzuki is a name that needs no introduction. This company has been providing the Indian population with automobiles from the day that we can imagine. Maruti Suzuki is known for offering cars at real affordable prices and the cars thus provided are all quality cars that come in amazing designs and are extremely hardy too. Maruti Suzuki cars boast of being among the most fuel efficient cars. The maintenance cost for Maruti Suzuki cars is the least and it is like a universal truth. These cars are made for the Indian crowd and Indian roads. One such amazing Maruti Suzuki car would surely be – Baleno. Maruti Suzuki Baleno comes with impressive interiors and also it is also a very sturdy car to use. Maruti Suzuki Baleno is very spacious and provides amazing mileage. It runs smoothly without any vibrations even at high speeds. The car gives a good mileage of 22 kmpl. This hatchback comes in both diesel and petrol variants. The amazing features adorning the car include – ABS (Antilock Braking System) with EBD (Electronic Brake Distribution) to enhance vehicular control, Infotainment system that makes use of apple and android devices for its operation and amazing projector headlamps. The car pays heed to safety of the passengers of the car, which is evident from the presence of ABS, EBD and airbags to safeguard the passengers in times of an unfortunate crash of the car. The infotainment system of the car is absolutely state of the art. It also uses Siri to make calls, receive and send messages. The cons of the car would include – no presence of rear AC vents, not a good steering response and average capacity diesel engine. The price of the car is 5.28 to 8.69 lacs. On the other hand, Maruti Suzuki Baleno RS belongs to the hot hatchback segment. The variant is based on the top-spec Alpha variant and carries over all the bells and whistles that a fully loaded Baleno is offered with. 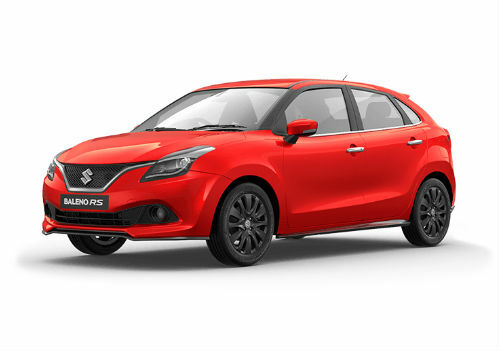 It retains the projector headlamps and LED daytime running lamps, the LED taillamps and the 16-inch alloy wheels as well from the original Baleno. There is absolutely no difference compared to the standard car as far as layout and equipment are concerned. The RS gets upgrades in terms of automatic climate control, a 7-inch ‘SmartPlay’ touchscreen infotainment system with Android Auto, Apple CarPlay and Navigation, steering-mounted audio controls and a detailed driver information display (MID). It also comes with usual convenience features which include all four power windows, reach and rake adjust for the steering, and a height-adjustable driver seat. In fact Baleno RS features the same voluminous 339-litre boot and gets a 60:40 split for the rear bench too, as the original Baleno. The biggest upgrade that comes along Baleno RS’s way is the new 1.0-litre turbocharged engine called the ‘Boosterjet’. This is a three-cylinder engine which develops 102PS of power and 150Nm of torque. The engine is coupled to a 5-speed manual transmission only, there will be no automatic variant available for the same. The car should be priced between 8.4 to 8.7 lacs which is not much in difference with that of the present Baleno.